Searching for answers. Searching for one’s identity. Searching for meaning. It’s something all artists do. 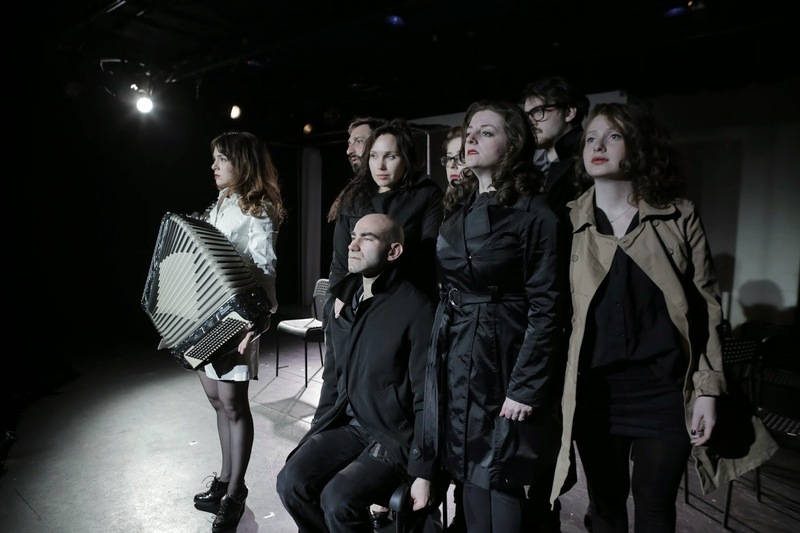 Inspired by these themes and the words of Soviet absurdist writer Daniil Kharms, the ensemble in Lost & Found Project’s Knock search for answers in a highly explorative manner that resonates with the ensemble much more than with the audience. It’s quite clear from the program notes that this is not a plot driven piece and you should remember that. Knock is an atypical theatrical experience. Instead, it’s series of vignettes in a monochromatic world of fears, loss, death and dreams that brought Kharms’s work, and a little of their own, to life. Through a patchwork of ideas, styles, and motifs, the ensemble journeys through a world where characters are lost in a universe of confusion. An understanding of Kharms’ writing is slightly important to comprehending the piece, but a successful devised work should transcend this, resonating with the unfamiliar. The work that the ensemble created had some wonderful moments. Though occasionally chaotic, director Alexandre Marine had a vision, bringing forth that vision. The through line though, was a bit repetitive. Highs would follow highs and lows would follow lows. Comedy after comedy, dramatic after dramatic. Since there is no clear plot and each piece seemingly lived in it’s own tiny world, perhaps a bit of a shuffle of vignettes would allow for a more cohesive work. Through clocking in at 90 minutes, it felt long. And not a good long. That may partially be due to the structure of the piece. It was evident that the ensemble moved as one, understanding the vocabulary of their own world. But there was one stand out performer who was much stronger than the rest. Masha King, the lost woman of the world and wonderful accordion player, had such a strong presence and ability to transcend from piece to piece that it was nothing short of stunning. King’s demeanor was sweet and had the ability to find the truth in the lack of answers. The other strong performance came from Boris Zilberman, who also was one of the adaptors and writers. Zilberman found safety in this world and brought comedy into the weighty world. Sergey Nagorny took the angry and dark road in many of the scenes, though the characters were meant to be different. The rest of the ensemble seemed to fill in the supporting roles, occasionally stepping out for their own centric act. Director Marine's concept allowed for some striking stage pictures, utilizing the space to its capacity. Though some of images were unconventional, he ensured that each scene had it’s own identity. The set by Marine and Ilya Medvinskiy featured a giant structure that you would think would be obtrusive, but it’s mobility and features allowed Marine to use it to the extreme, representing an assortment of objects. The decision to keep the world in greyscale allowed the moments of color to pop. Additionally, the costumes seemed to fit each individual’s personality well. Knock certainly had it’s moments but on the whole, it was lacking the appeal factor. Resonating to the artists is important but translating that to the audience is what is important. Sadly, that did not entirely happen. Knock was ambitious, but ambition is not always enough.